For some time now, I've been following the genealogy blog of a Dutch Facebook friend and accredited genealogist, Yvette Hoitink, who is using the Genealogical Proof Standard to attempt to prove that she is descended from Eleanor of Aquitaine, her supposed 26th-great-grandmother. As I've been reading these fascinating posts which Yvette publishes once a month, going back one generation at a time, I've been thinking, "I should be doing something like this to show that I've accurately traced back my ancestry!" My goal at this time is to work all my lines through my great-great-grandparents' generation, which will be a total of 31 posts. So this is my first post in this series, which proves that I am my parents' biological child. Because my parents are both living, I'm not going to provide the full details that I would in a post where all ancestors are deceased. A photo taken of me at one week old, held by my mother. My official birth certificate from the State of Alaska, with the signatures of my mother and the attending physician. This certificate also gives the age of my parents at the time of my birth, and their general birth locations. The Certificate of Birth from the hospital in which I was born, signed by the attending physician. It also has my footprints and my mother's thumbprints, and gives my parents' birth dates and specific birth locations (cities of birth). The certificate from my parents' church enrolling me in the Cradle Roll of the church, at the time of my Dedication to God at one week old (a religious event similar to christenings in other churches). A birth announcement published in the local newspaper of my mother's hometown of Grand Rapids, Kent Co., Michigan. Birth announcements handmade by my mother and mailed out to family and friends, one of which is in my baby book. 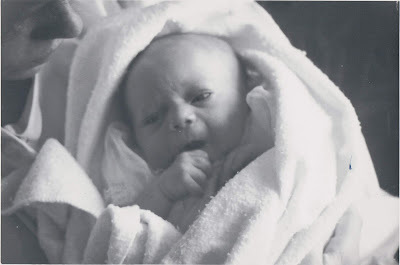 In addition, there are a couple of photos of my expectant mother taken during the time she would have been pregnant with me; many photographs taken of me at a very early age with my parents (I was the first child and first grandchild! ); many cards of congratulations about my birth kept in scrapbooks and my baby book by my mother; a letter my dad wrote to his parents shortly after my birth; stories my mother told me about the day I was born; and my own earliest memories of my parents dating back to when I was 18 months old (yes...I remember seeing the local school on fire and hearing the town siren!) and 27 months old (accompanying my father to the local airstrip to pick up a wreath of flowers someone had shipped to be placed on the grave of my infant brother). 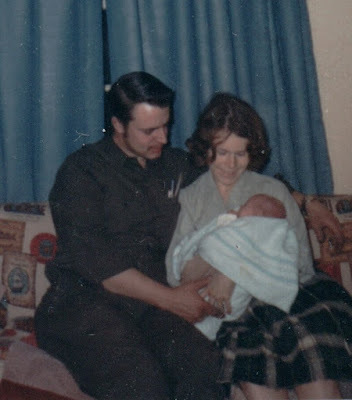 My parents and me, when I was about three weeks old. I believe my maternal grandmother took this photo, as she had come to Alaska from Michigan to help my mother care for me. However, documents, photographs, and memories do not provide 100% proof of biological parentage. After all, there are many stories of secret adoptions, babies being switched at birth, and other examples of Misattributed Parental Events (MPEs) that one occasionally reads about. While I truly had no doubts about my parentage, I did want to have my parents test their DNA for genealogical purposes, especially since my paternal grandmother was an adoptee. My parents agreed to test through FamilyTreeDNA, and the results show my parents and I each share 3,384 centimorgans--or 50%--of our DNA, which is consistent with the amount of DNA shared in a parent/child relationship. So there you have it: I am my parents' biological daughter!